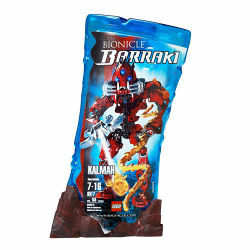 8917 Kalmah is a BIONICLE set released in 2007. Kalmah is one of the six Barraki. He is red in colour and has three blue eyes. He has two tentacles attached to one hand and a Squid Launcher in the other. The set also comes with two Sea Squids that can be attached to two holders on his back, despite the box showing them at the top of his arm, but below the shoulders. In the BIONICLE universe, he lost his third eye to Pridak. He also discovered the vampire Squid. Some images of him have dark red Hordika feet, although he has upgraded versions instead. Kalmah was one of the six warlords of the League of Six Kingdoms and ruled the northwestern region of the empire. Initially, Kalmah did not want to join the League, as he was unwilling to have others dictating his actions. However, he was forced to join when Takadox allied with Pridak, fearful of having his empire cut off from the rest of the world. He took part in a meeting where the Barraki threatened the Brotherhood of Makuta into supplying beasts for war. During this time, Kalmah noticed the strange actions of the Blade Burrowers. The creatures would tunnel in specific directions, which Kalmah mapped, although he could not understand it. He was defeated along with the other Barraki during an ambush from the Brotherhood of Makuta. There, Kalmah was brought along with the others by Botar to the Pit moments before they were to be executed by Makuta Teridax. They were then trapped for many years until the Great Cataclysm destroyed the Pit and allowed them to swim out into the open where they were mutated by the mutagen in the waters into water-breathing creatures. Kalmah commanded an army of squids, which included Giant Squid. He also discovered the Sea Squids, vampiric squid that drained the natural life force out of people, and who bred them for the Barraki's use, starving and abusing them so that they were always ready to attack. Kalmah would not allow anyone to enter the chamber where the squids were bred ever since Mantax ate half the brood. He was blinded in his top eye at some point as the result of an argument with Pridak. Kalmah was informed by one of his Sea Squids of the arrival of the Kanohi Ignika. After meeting the other Barraki, they decided to split up to search for the Ignika. While searching for it, he caught Takadox skulking behind several rocks. After interrogating his fellow Barraki, Takadox revealed he was spying on Mantax, as the secretive Barraki went into the old prison every night to look for something. After following Mantax to the remnants of the Pit, they were trapped inside, and attacked by Zyglak. They were accidentally freed by Nocturn, who attacked the Zyglak. Kalmah later sought out and found Mantax at Pridak's behest. The two Barraki spotted Dekar, carrying the Kanohi Ignika, swimming for the safety of a nearby cave. They pursued the Matoran, but were incapacitated by the giant Venom Eel, which had been created by the Mask of Life for its protection. He recovered later, when the other Barraki returned, accompanied by Brutaka. After a small disagreement between the warlords and the newcomer, Kalmah had one of his Giant Squids seize Brutaka and carry him away, into the Black Water. The five Barraki then continued their attempt to retrieve the Ignika from Dekar. Pridak grabbed the mask from Dekar, causing the Ignika to emit a bright flash of light as a signal for help. Recovering from the signal, Kalmah let Dekar go as he searched for his fellow warlords. Coming across an enraged Pridak, Kalmah attempted to relieve the Ignika from his clutches, only to be repelled by the maddened Barraki. Kalmah had Takadox subdue Pridak with his hypnotism, and brought news of six new Toa. Kalmah and the others went to investigate. Kalmah and the other five warlords confronted five of the Toa. When insulted by Hahli, Kalmah attacked her, but was countered and left stunned on the ground. Kalmah recovered, and joined the other Barraki in escorting them to some caves, where they were guarded by various sea creatures. He later attended a meeting of the warlords to discuss the Ignika's fate in their plans. When Takadox stepped in and suggested the mask be placed in the Razor Whale's Teeth, Kalmah readily agreed. When the rest of the Barraki left to deliver the mask, Kalmah and Carapar returned to the Toa Mahri's prison, to see if their prisoners were still captive. As they returned, they saw Jaller and Kongu escaping. After a short struggle, the Barraki were deflected by an ancient sea beast awoken by Kongu's Kanohi Zatth. Kalmah threw the weakened Toa at the beast as a diversion, and escaped with Carapar. Swimming to the cave where the Sea Squids were bred, and the other Barraki were meeting, Kalmah learned that Nocturn and the Ignika were both missing. Kalmah correctly surmised that Nocturn had walked off with it. A short debate led them to suspecting the Toa of possessing the mask. Kalmah and Carapar later stumbled upon Jaller and Kongu, assaulting them with sea squids. After the Toa managed to free themselves, they struck a bargain with warlords: information, in exchange for killing Pridak. The Toa agreed, and the Barraki withdrew their forces in preparation. Mantax came into possession of the mask, and called for the warlords to meet at the Razor Whale's Teeth. During this meeting, Mantax threatened to destroy the Ignika, unless one of the Barraki revealed his nature as the traitor who sold them out to the Brotherhood 80,000 years ago, which he had discovered due to the presence of a Tablet of Transit in the Pit. The meeting was interrupted by an avalanche, triggered during a fight between the possessed Pit robot Maxilos, and a duplicate of their jailer Dekar-Hydraxon. Takadox at this moment, revealed his treachery by stealing the mask and tablet. Regrouping, the Barraki reluctantly did not kill Takadox, keeping him alive to help find the Ignika. During a fight with Teridax, who revealed his possession of a Maxilos, Kalmah pretended to have been downed by the Makuta; however, he and the other Barraki were faking, in order to give their armies enough time to gather. Uniting with his fellow warlords, Kalmah launched his army, along with the other armies, in a single, massive assault on Maxilos. Having taken revenge on the being responsible for their downfall, the six armies pursued the Toa Mahri, who had acquired the Ignika. The Toa had recently severed the Cord that tied Voya Nui to Mahri Nui, and were now in pursuit of it. During the chase, Kalmah felt the chill that heralded the death of Mata Nui, but ignored it in his mad pursuit of the mask. He sent his forces after the five Mahri who remained behind to buy their ally some time. Kalmah was attempting to flee from Jaller's impending Nova Blast when the Mahri were transported back to Metru Nui, a last act of Matoro. With no more danger from the Toa, one of their own revealed as a traitor, and their last hope of returning to the surface gone, the Barraki dissolved to their individual factions, attempting to elude the jailer and his robot guardians. Kalmah was soon captured and imprisoned by Hydraxon along with Ehlek, Pridak, and Mantax. Hydraxon was given orders to offer the remaining Barraki a choice: join the Order in the war against the Brotherhood, or suffer worse punishment than what they had already received. Pridak soon accepted the offer on the Barraki's behalf, and Kalmah along with the others was fitted with an apparatus to allow him to breathe on land. He took over as the tactician for the army that the Barraki amassed from the scattered corners of the universe, though Pridak's battle lust was such that he began moving before Kalmah had even drafted a plan. Kalmah, flanked by Mantax and Ehlek, departed to the island of Xia. There, they confronted the Shadowed One in the island's main factory, and suggested an alliance between the Dark Hunters and the Barraki. When the Shadowed One questioned what the Barraki could give for the alliance, Kalmah responded by telling the ruthless leader that they were aware of the presence of a prototype of the virus which was used to struck down the Great Spirit Mata Nui on Xia, and that the Shadowed One had retrieved this virus and that it was currently in his possession. The Barraki then told the Dark Hunter leader that they knew how to use the virus, and offered their knowledge in return of an alliance. The Shadowed One responded by telling them that he will meet with Pridak in the land of Karzahni, where they can discuss the alliance. The alliance was made soon after, and Kalmah rebuilt his legions. They were ready to attack Metru Nui once the Shadowed One had released his viruses against Teridax. As a consequence of Teridax's death, Kalmah left the universe and arrived on Spherus Magna. His mutations were reversed when Mata Nui was using the Ignika to restore the planet. This is a description taken from LEGO.com. Please do not modify it. (see an archive of the product's page) Caught in the grip of Kalmah! Cunning and brutal, Kalmah strikes fear into the hearts of the fiercest sea beasts. His tentacle can crush his foes, or he can use his sea squid launcher to drain their life force. The tentacles on the back of his head help him to sense surprise attacks before they happen. Commanding an army of giant squid, Kalmah may be impossible to stop! This page uses content from BIONICLEsector01. The original article was at Kalmah. The list of authors can be seen in the page history. As with Brickipedia, the text of BIONICLEsector01 is available under the GNU Free Documentation License, however please help to make this a unique article to Brickipedia in any way you can. Caught in the grip of Kalmah!